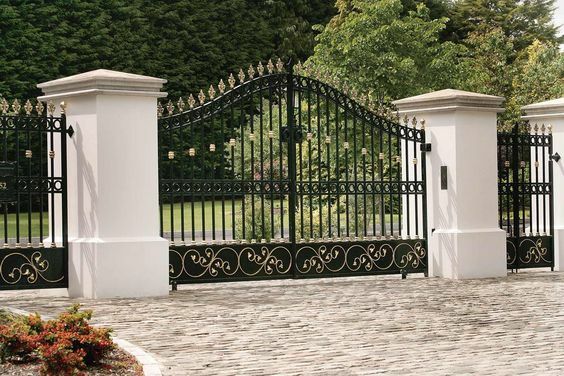 If your property is enclosed, consider the idea of installing a stylish driveway gate. They usually come in a wide variety of styles and are a smart way to display your personal taste and style. 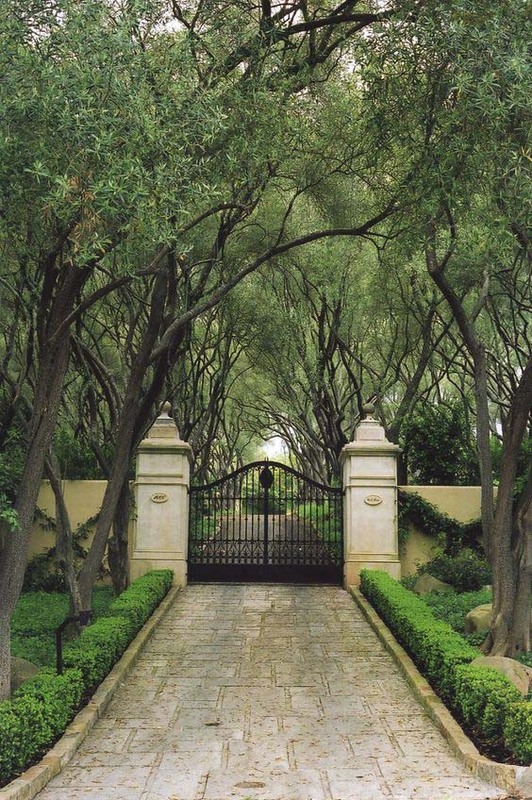 Driveway gates are the introduction to your landscaping design. 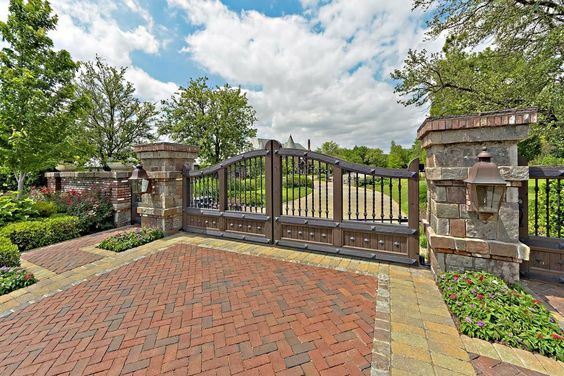 We have prepared 28 Cool Driveway Gate Ideas for you. I hope you will find what you are looking for (fingers crossed). 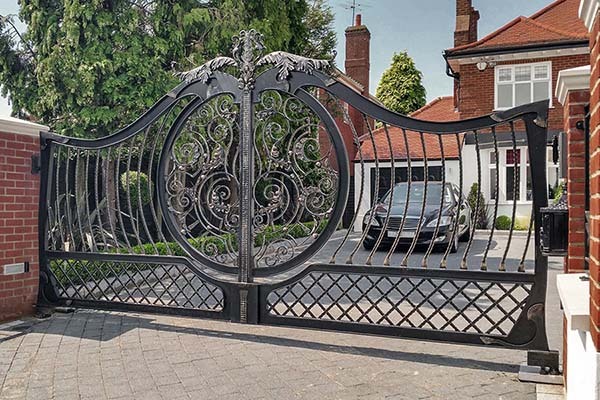 I will start my collection of residential driveway gate ideas with this stylish mid-sized traditional metal driveway gate. I love the thickness and the edging of this door. There are limitless wood driveway gate ideas on the internet. I like this solid farmhouse style gate as it gives a really unique entrance to your home. However, keep in mind that you should take care of the wood regularly as it is exposed on constant sun and rain. 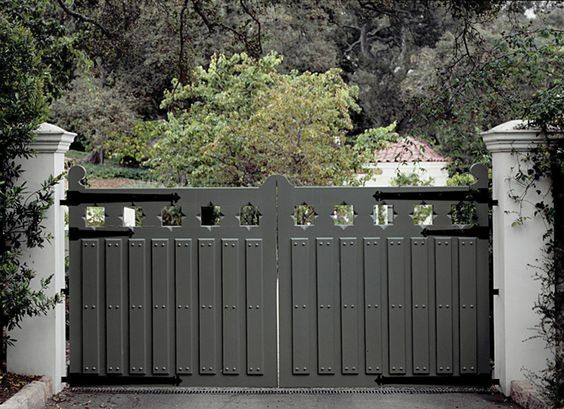 For those of you who are fans of the simple driveway gate ideas, here is another classic ranch style automatic driveway gate. Its main advantage is the matching pedestrian walk-through gate. 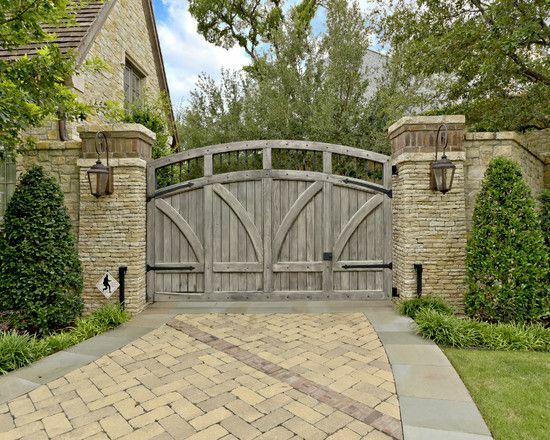 This solid metal door is one of my favorite driveway entry security gate ideas. It is jazzy and very secure at the same time. 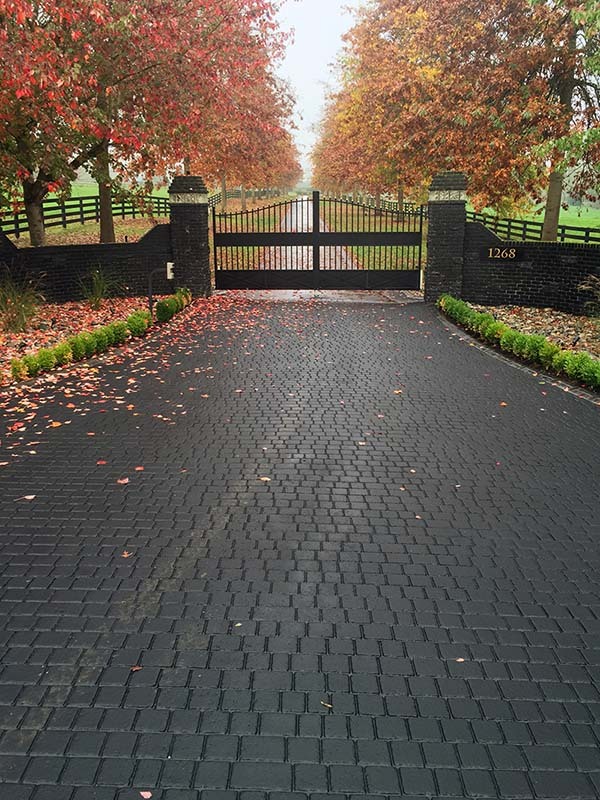 I think you must add this photo to your list of the coolest gate driveway ideas! 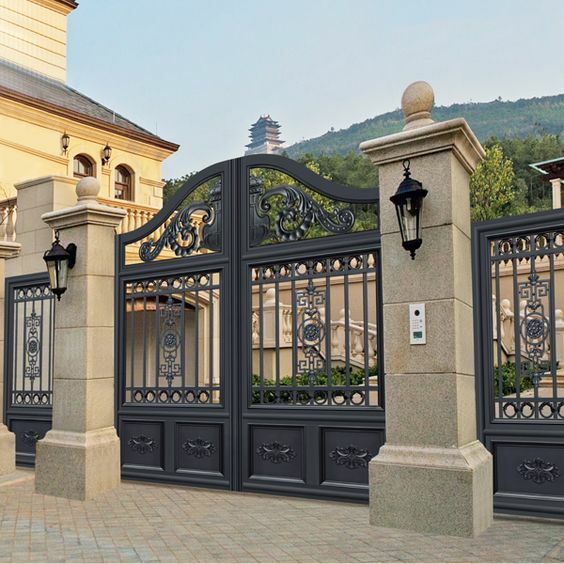 This substantial driveway gate with wrought-iron lattice will give your entrance a very luxurious look. The front lamps bring a strong hoary vibe. 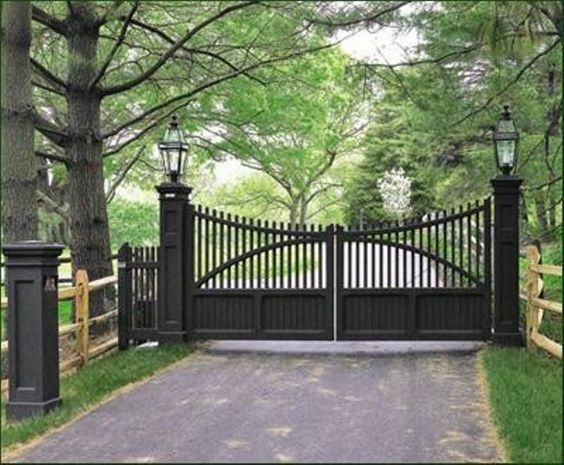 Still searching for some great country driveway gate ideas? Then, take a look at this personalized large automatic ranch/farmhouse door? It’s decorated with deer ornaments for a more countryside look. 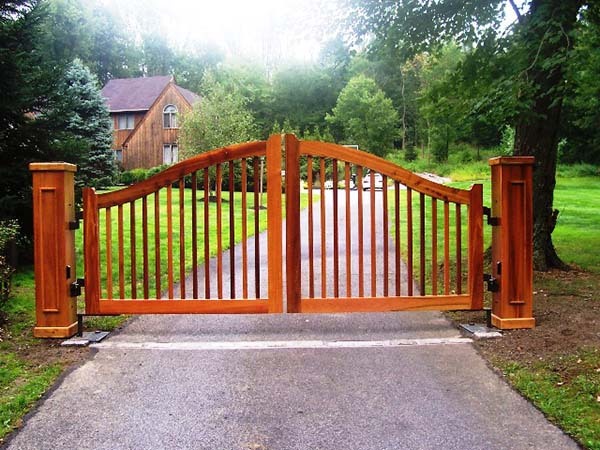 If you are on a budget, I suggest finding some wooden driveway gate ideas as they are usually a bit cheaper than the metal and ironed entrance doors. The rustic one on the picture above is welcoming guests to a lodge in Texas. Very western style, I might say. 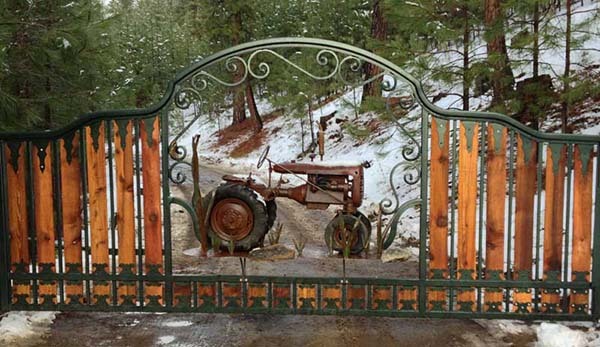 There is a nice timber frame wood gate with wrought iron hardware. 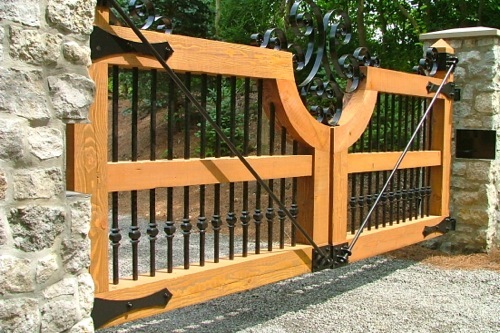 It is not one of the cheap driveway gate ideas, however, many people love to combine iron and wood material. 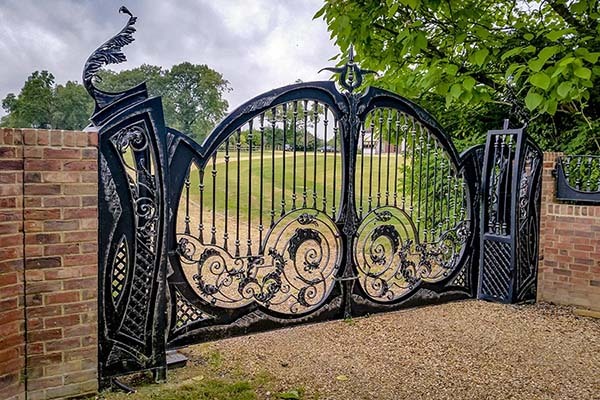 This piece of art is made by a company, called Ornamental Gate and Fence, which is turning various driveway gate ideas into beautiful reality. 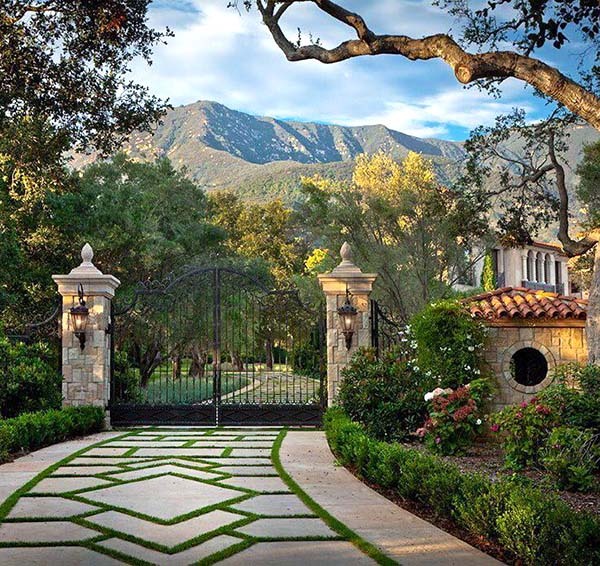 If you have an idea about an ornament, call them and they will do their best to turn your idea into a beautiful driveway gate. Thuja Wood Art is using reclaimed Red Cedar to build stunning custom driveway gates. Love the hardware details, they “smell” like a countryside house. Decoration possibilities are countless. Following the iron driveway gate ideas, here is another whimsical wrought-iron electric gate. It’s like a decor from a Harry Potter movie, don’t you think? I suppose there is a castle nearby. 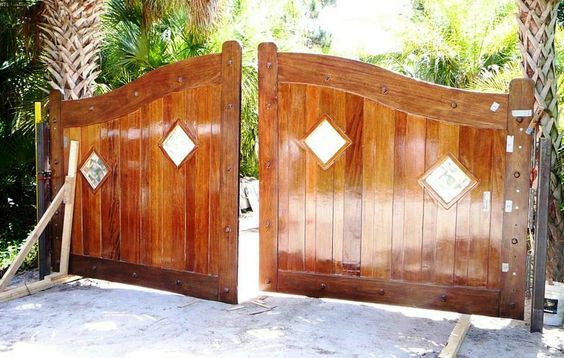 This mid-sized Mediterranean style wooden driveway gate will impress each of your guests. It pairs well with the exotic greenery in the garden. 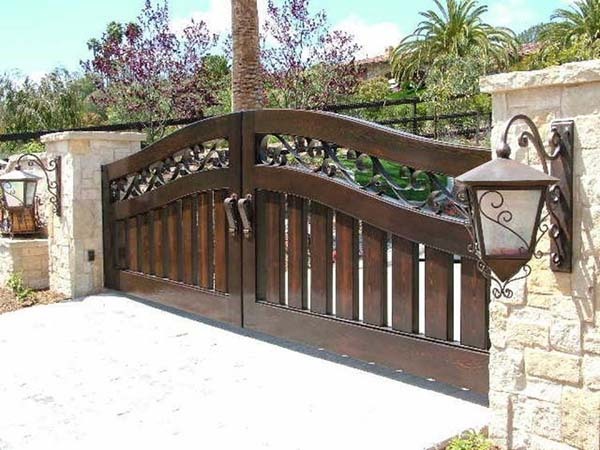 Many people know from the beginning that they want a wooden entrance door, however, they are struggling to find the best wooden driveway gate design ideas for their style and taste. 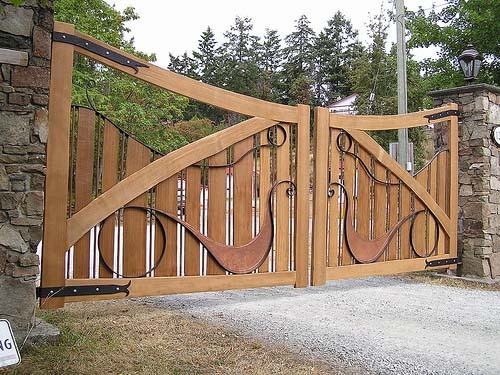 Simple shapes and forms work great when it comes to gates. This simple manual wooden entrance door is a great match for a seasonal house at the seaside. The sliding driveway gate ideas are usually better for a frequent use. This wooden one, made by Gate Power, could fit well every residential home. 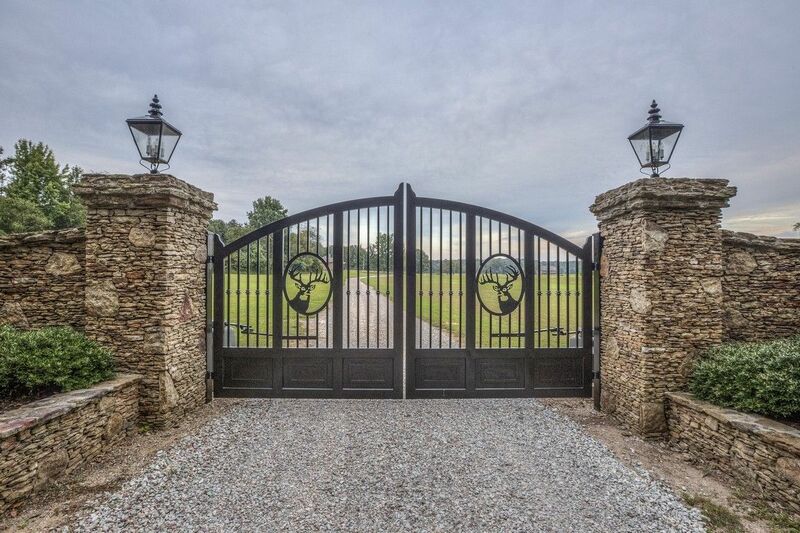 One of my favorite iron driveway gate ideas! I like its thickness and the tree-lined road. 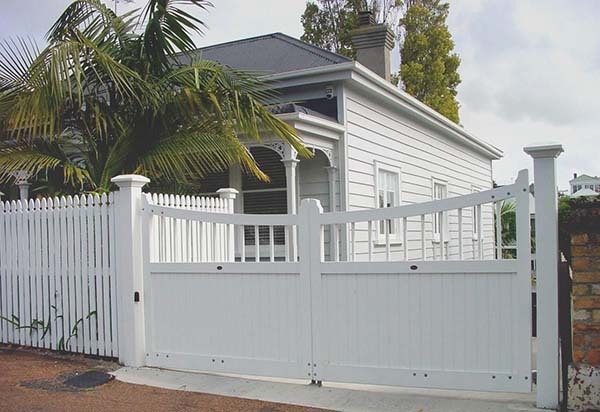 Lovely wooden driveway gate painted in white that would fit your seaside bungalow. It combines the elegance of yesterday and the functionality for today. 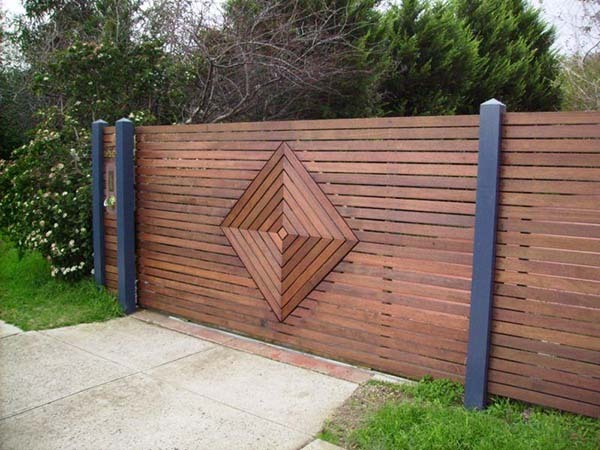 Contemporary driveway gate ideas are known for clean lines and simple design patterns. 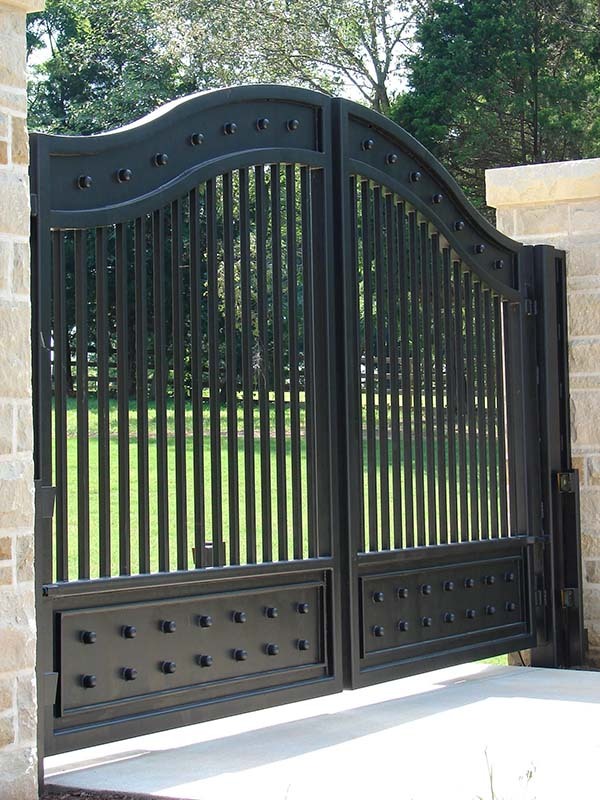 While some current entry gates have curves, they more commonly feature straight lines or angular designs. Here is a nice way to have a solid automatic security entry gate that still looks friendly and welcoming. If you would like to have more privacy, choose a driveway gate that hides the landscaping and property inside. 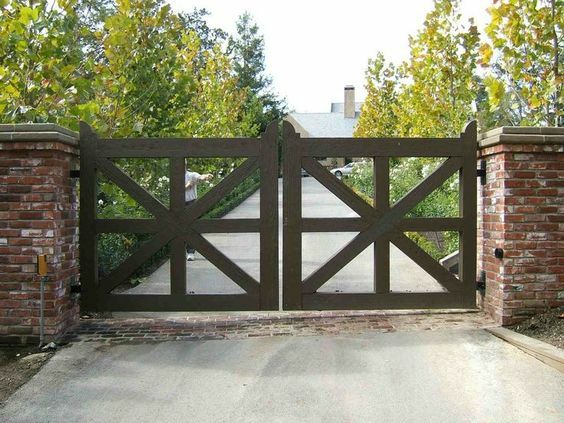 Here is a country house-inspired wooden driveway gate that is painted tan rather than white or wood stained. This gate also features stone pillars that match the stone walls. This welcoming custom wooden entry gate with nice lighting details can fit any type of property. Adding some nice lanterns to the gate makes it more welcoming. This personalized wrought-iron automatic driveway gate gives your entrance a posh luxurious look thanks to the gold accents. Scrollwork on inlays and along the top of the gate. 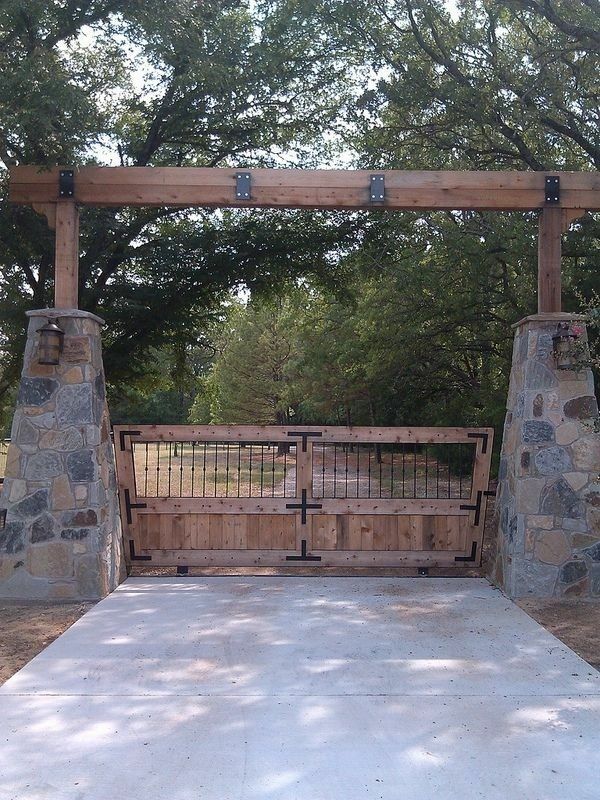 Looking for some cheap driveway gate ideas for your ranch entrance? This might be the answer! 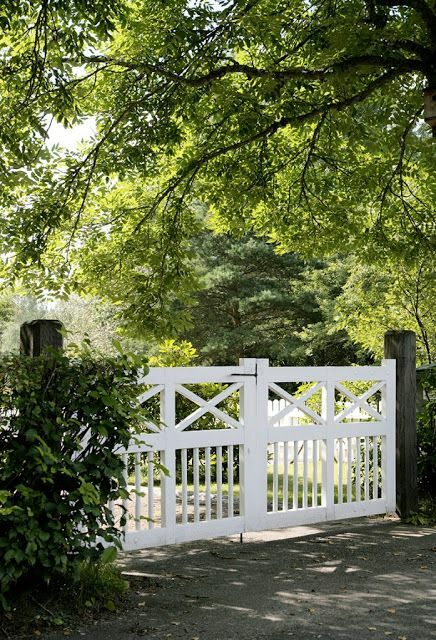 This clean, transitional style wooden driveway entry gate with white posts contrasts the greenery around very nicely. 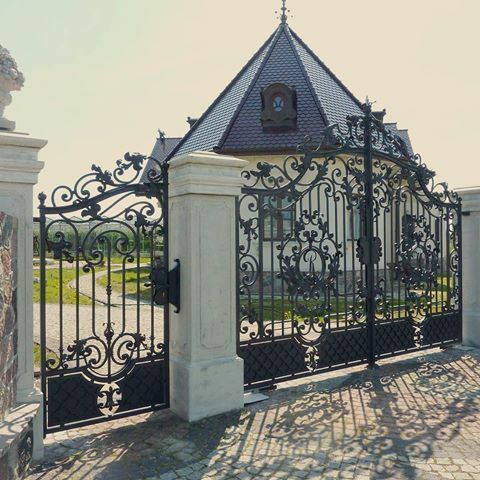 The wrought-iron details with initials and acanthus give the entry gate a classy finishing look. I’d like to share the picture of this mid-sized vintage, streamlined metal driveway gate design with stone pillars and a unique lighting fixture. 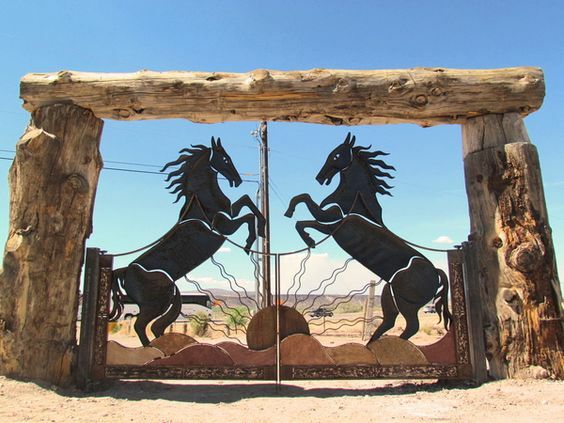 At the end of my collection of fantastic driveway gate ideas, I’m showing you this unique ranched-inspired artsy driveway door. It presents such a powerful and inspiring picture, don’t you think?